In the modern music world, the old saying, “There’s no money in jazz,” pretty much holds true. For every Miles Davis, Keith Jarrett, Dave Brubeck or Wynton Marsalis, there are thousands of others – highly-skilled artists who night in and night out use their creative juices in an effort to stand out and make a name for themselves, draw encouraging crowds wherever they go and hopefully, land lucrative recording contracts. For many jazz musicians, the search for success is an uphill battle, a constant struggle. In order to survive, even our most recognized jazz greats – people like Charles Mingus, Herbie Hancock and McCoy Tyner – had to accept menial jobs along the way, i.e. working for the US Postal Service, toiling as a shipping clerk or driving taxi cabs. And so it goes if you’re a photographer, a writer, or an aspiring author trying to sell his or her own work – regardless of your field of endeavor or your level of expertise. Literally everyone searching for a publisher has had their share of rejection slips. Getting published, even for the most famous among us, can often appear as practically an insurmountable undertaking. The first book proposal by Canadian novelist L.M. Montgomery was rejected by five different publishers. After putting her manuscript in a hatbox for two years, she finally resubmitted it to L.C. Page & Company. The result: Anne of Green Gables went on to sell 50 million copies. Likewise, Thor Heyerdahl believed his book Kon-Tiki: Across The Pacific was particularly unique, but 20 different publishers all disagreed. His 21st submission to Simon & Schuster wound up selling 20 million copies. As a freelance jazz photojournalist intent on doing a book of my own, I had amassed a cache of valuable photographs and personal stories. With all that material, I had the loftiest of expectations; not in selling a million copies, but just in finding a publisher. Indeed, when I had completed my work, Jazz In Available Light: Illuminating the Jazz Greats from the 1960s, ‘70 & ‘80s – and developed what I believed was a compelling, hard-hitting book proposal – I was sure that my efforts would be welcomed with open arms. Instead, my search for the right publisher dragged on for many months, and my rejection notices kept piling up. Sure, I was disappointed during much of that time, but I chalked it up as just another learning experience. I knew that persistence and perseverance would eventually pay off. Rather than get depressed, I remembered back to some of my earlier business dealings that also didn’t go as planned. In each case, the setbacks occurred because of another party who was involved in the transaction, i.e. a magazine editor failed to credit and pay for a published photo; someone reneged on an agreement/assignment; an equipment manufacturer illegally used a photograph of their sponsored artist; or a producer decided not to honor a contract and had to be sued in small claims court. Thinking back about one unusual event that occurred long ago now strikes me as rather humorous. I recalled that night in August of 1969 while covering the Concord Summer Festival. Visiting backstage prior to the opening set, I was approached by a representative of vocalist Carmen McRae, who explained that she was doing a live recording that night and needed photographs to view for possible album use. As soon as the announcement was made and Carmen appeared onstage, the scene held all the trappings for what would be a special, momentous occasion. The perfectly-coiffed diva was outfitted in a dynamic mod-influenced, pink background, high fashion designer creation that absolutely stunned the audience. Similarly, she exuded that resolute, in-charge attitude of hers and performed brilliantly throughout the set. I had a ball photographing her. I was pleased when I saw my results a short time later, and after reaching out to her rep was told to contact Ms. McRae directly. When I called Carmen, she set a time for the two of us to meet in San Francisco. Anticipating our get-together, I brought with me about 15 of the images that I felt were the most expressive and revealed her in the optimum, best moment. Needless to say, that set of circumstances was pretty unsettling at the time. I was not prepared to hear those remarks. But I thanked her for reviewing what I had and then left. 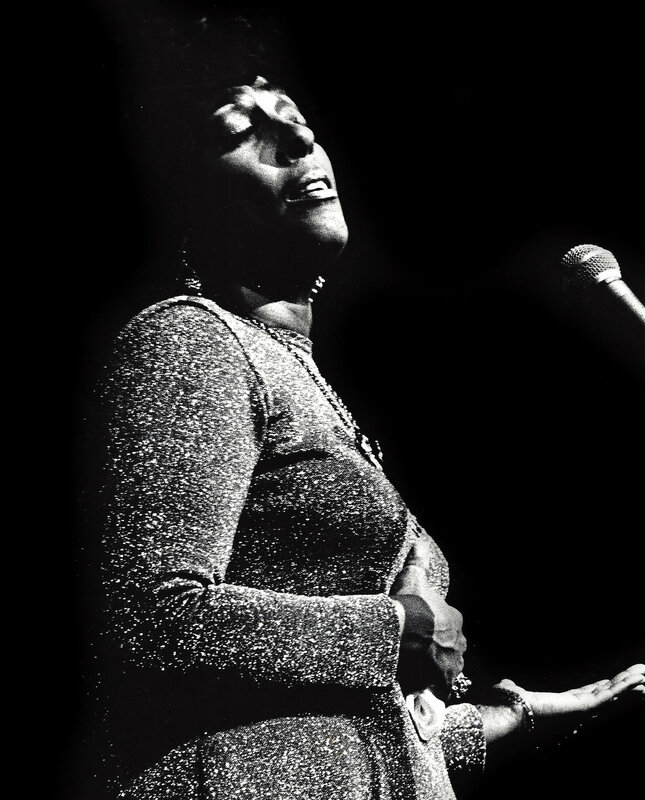 To my knowledge, no recording was ever made of Carmen McRae that night in Concord.